Barcelona, Spain (April 25, 2017) – Etnia Barcelona celebrates the launch of its first flagship store located in an emblematic building of seven levels, just outside of the Basilica of Santa María del Mar. Remodelled by the architect of the Camper Hotels and Lázaro Rosa Violán Studio, the new store is inspired by the traditional interior design of Barcelona apartments and is home to all the artist-inspired collections of the brand. This new iconic space of the Barcelona eyewear brand occupies a total area of 8600 sq. ft. distributed over seven floors, each of which is designed to fully express the DNA of the brand. Two of these floors are dedicated to sales and showrooms specially reserved for its Optician Customers, press and brand ambassadors. The top floor boasts a private rooftop terrace with exceptional views over the gargoyles and stained glass windows of the Basilica which inspired the Best Seller "The Cathedral of the Sea”. The Flagship Store is Etnia Barcelona’s first independently owned shop and is a temple to its eyewear, offering a complete brand experience. The new iconic space will present all the collections of the brand: Originals, Vintage, Advance and the capsule collections that Etnia Barcelona has developed with artists from the worlds of art and photography, such as, Nobuyoshi Araki, Yves Klein, Steve McCurry or Jean Michel Basquiat. 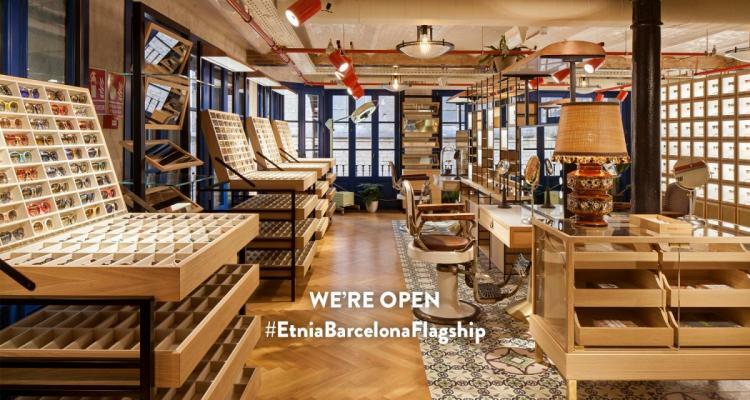 The Etnia Barcelona Flagship Store is all about the roots of the brand, about the city in which it came of age and the great influence the city has had on the brand. It expresses the modern, disruptive character of the brand through a leading edge avant-garde architectural and stylistic intervention. El Born is, and always will be, one of the oldest, most authentic historical districts of the city. The Etnia Barcelona creative team has played an active role in the work and interior design of this iconic space. The pattern of the hydraulic flooring tiles, used over the entire floor of the store, is a design created by Etnia Barcelona for one of the brand’s points of sale. In the words of David Pellicer, founder and CEO of Etnia Barcelona “We are delighted to open this, our first Flagship store in the world, especially since it is here in Barcelona, our city, the city that has lent its name to our brand. It takes the scope of our brand one step further since, to do so, what the need was to gain first-hand experience of the tastes of users of our products”. Etnia Barcelona is an independent brand, first established 17 years ago by David Pellicer, the third generation in a family of eyewear manufacturers, who sought to bring a splash of color to a world up to then immersed in browns and blacks. From the very outset, and right through to today, the brand has grown at a vertiginous speed. It exports 90% of its collections and has offices in Barcelona, Miami, Hong Kong and Vancouver. Inspired by people, culture and travel, Etnia Barcelona designs eyewear for all and has made its brand values, quality, color and culture its leading ambassador, the true key to success.